I always make at least two turkeys between the months of November + December. This year I am expecting to be roasting four birds within the next two months. I know, I know, that is a LOT of turkey… and well, it will make for even more turkey leftovers. I already have one roasted turkey under my belt, so three more to go! Two at Thanksgiving and another at Christmas. I’d say that I might be overwhelmed with turkey leftovers, BUT then I came up with these turkey enchiladas. 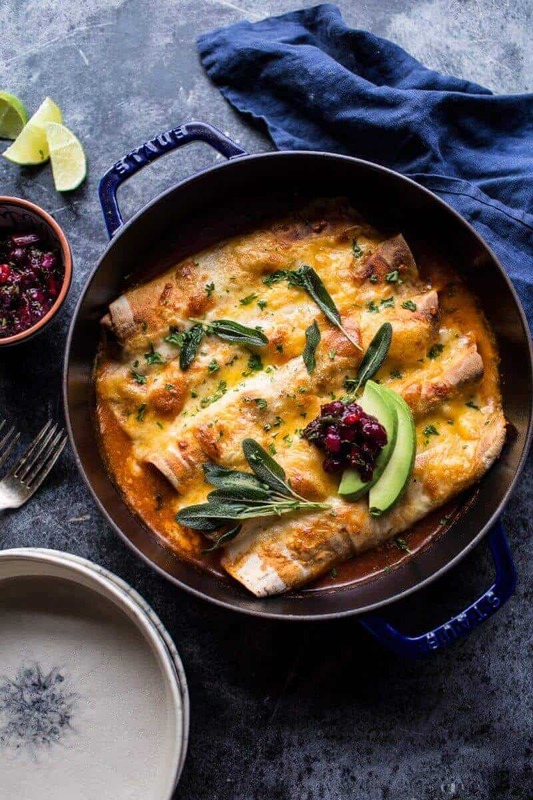 These enchiladas, they are such an awesome way to use up all your delicious leftovers… and with a twist that’s completely different from the day before! 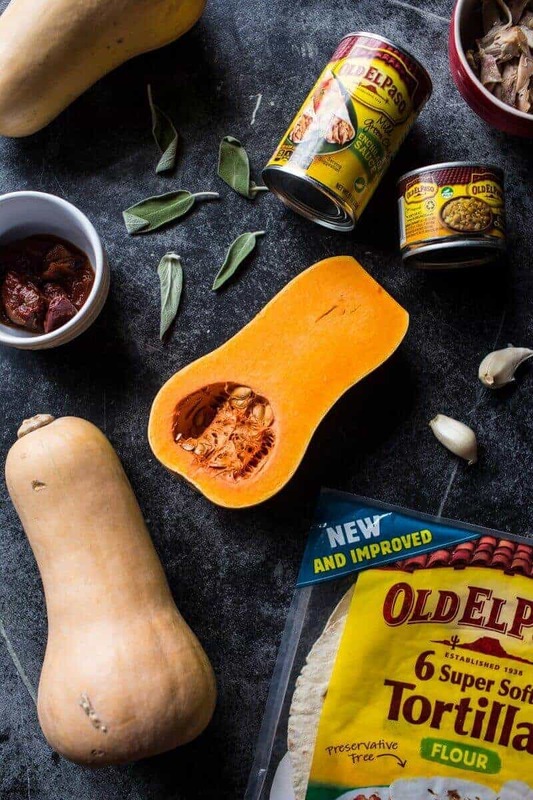 They are made up of all of my favorite fall ingredients: turkey, butternut squash and sage! I even added a cranberry salsa to seal the deal! Best Turkey Day leftovers ever, right?!? These will have everyone happy come Black Friday! Trust me! Speaking of Black Friday, have you guys started Christmas shopping??? Like it has not even entered my brain, like I am still planning Thanksgiving! But man, I better start thinking about Christmas gifts, it’s my goal this year to be on my A game and actually not leave everything to the last-minute. But the good news is that I still have time to get on track, right?!? Any tips from you crazy organized people? What are you guys getting for your family members? I would love to hear about the latest, greatest hot gifts. I always do the shopping for my mom’s gifts. It’s the best, and well, I think I am the only person in the family who really has a clue on what to get her. This year though, I am kind of stumped. I always do some clothes, sweaters, scarves… you know warm and cozy. For a while it was also tradition that mom got a hot chocolate maker on Christmas, because typically they would only last one year and then it was time for a new one…but that got old, plus her current version is going strong. So this year I am stumped. I need to put some thought into it for sure. Totally curious to know what you guys get your family members… please, tell me, tell me! Also, I am not a Black Friday shopper. Totally a Cyber Monday girl, and honestly even that’s hard. Are the deals worth it? 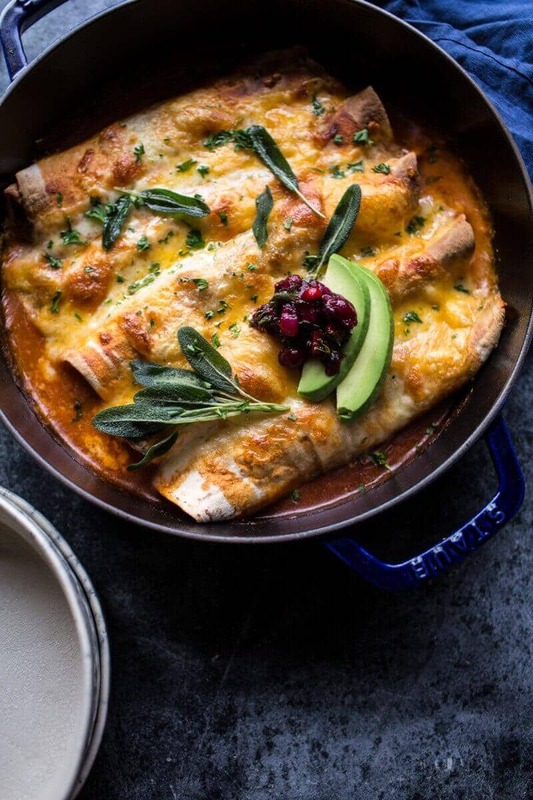 So while these turkey enchiladas would be great for Black Friday, they would be equally delicious anytime. You can always replace the turkey with shredded chicken and then this dish becomes an EASY everyday kind of meal. The sauce is made up of my two favorite Old El Paso products, the Red Enchilada Sauce AND the Green Chile Enchilada Sauce. Yup, it’s a double sauce kind of Sunday and you’re going to LOVE it! 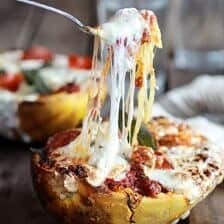 Of course, there’s my favorite butternut squash in this dish, and yes, we all know I could never leave out the gooey cheese! Make sure you don’t forget the crispy sage (it’s simply the best)! And last but not least, that cranberry salsa…which if you did not know, is my GO TO way to use up leftover cranberry sauce. Gimme all the sweet + spicy flavors please!! So can we do a little Sunday Mexican feast now… and then again on Black Friday?!?! 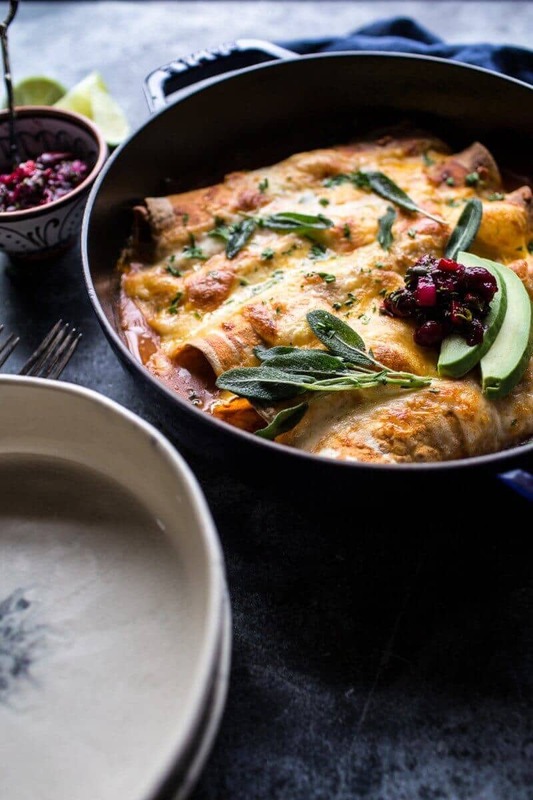 Spicy Green Chile Turkey, Butternut Squash and Crispy Sage Enchiladas. Set a large, high-sided skillet over medium heat. Add the olive oil and butternut squash, cook for 8-10 minutes or until the butternut squash is just fork tender. Add the chipotle chile powder, cumin and sage. Continue to cook about 1-2 minutes and then slowly stir in the green chile enchilada sauce, diced green chilies and milk. Cook for 5 minutes or until the sauce is warmed through. Remove from the heat and stir in the turkey, cranberries (if using) and half of the shredded cheese. Lightly grease a 9x13 inch-baking dish. Pour half of the red enchilada sauce into the bottom of the baking dish. Working with one tortilla at a time, lay them flat on your work surface and spoon about 1/3 cup of the turkey mixture into each tortilla. Roll them up and place the enchiladas in the prepared pan with seam side down. Top with remaining red enchilada sauce and cheese. Bake for 20-25 minutes or until the cheese is melted and gooey. Meanwhile, melt 1 tablespoon butter in a saucepan. Add sage leaves. Cook on medium-low for 1 minute, flip and cook one more minute or until the sage has darkened in color, but is not burnt. Remove from the heat and place the fried sage leaves on the top of the enchiladas. 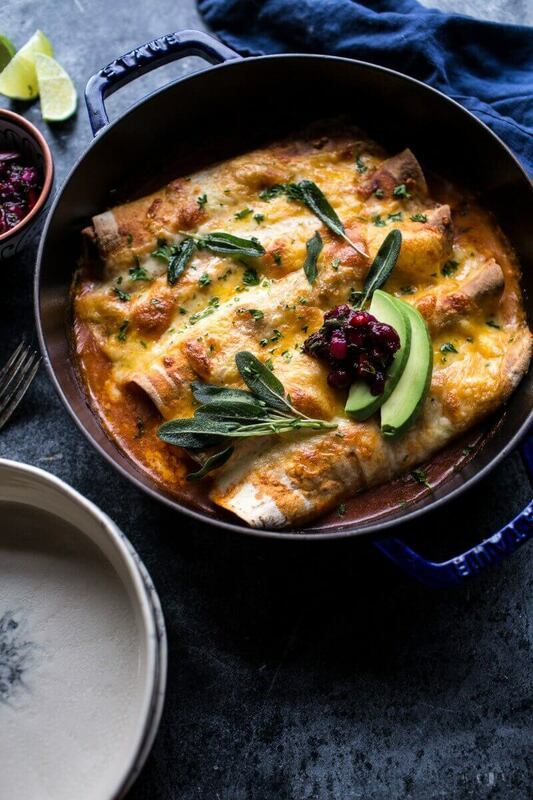 Serve the enchiladas with the cranberry salsa (below). EAT! To make the salsa, mix together the cranberry sauce, pineapple, jalapeno, cilantro and lime juice in a bowl until combined. *If you do not have turkey on hand, replace it with cooked shredded chicken. 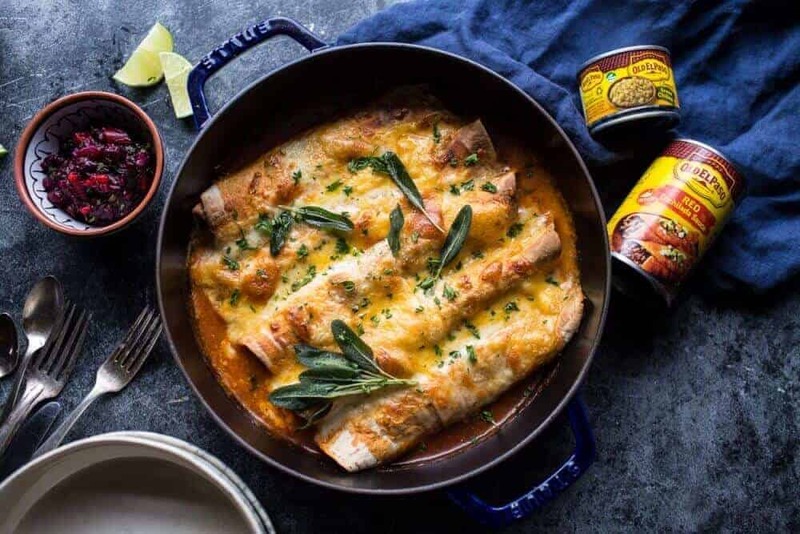 *To make these enchiladas in advance, prepare everything as directed, but stop before baking. Cover and store in the fridge for up to 2 days. Bake as directed. *You can also freeze these enchiladas. Just cover the unbaked baking dish tightly with foil and then again with plastic wrap. Place in the freezer for up to 3 months. Thaw in the fridge overnight and bake for 30-40 minutes, covering with foil if the top is getting too browned. i’m not the biggest fan of turkey; it’s always a little more bland and dry than i want, and i find it more worthwhile to devote stomach space elsewhere. that being said however, these sound amazing! the combination of mexican, thanksgiving and all that cheese seems like it shouldn’t be real (but it is!). LOL! I totally get what you are saying, turkey is not my favorite food either!! Thanks Heather! Hope you had a great weekend! I love mexican inspired dishes, the depth and warmth of flavour in them is always soooo enticing for me. Alas, my son will not touch anything mexican, so I am always craving it and never having it – I have managed to gently ease him into very mild curries, so there’s still hope!! OH man!! Get him onto Mexican, it is the best! THANK YOU! 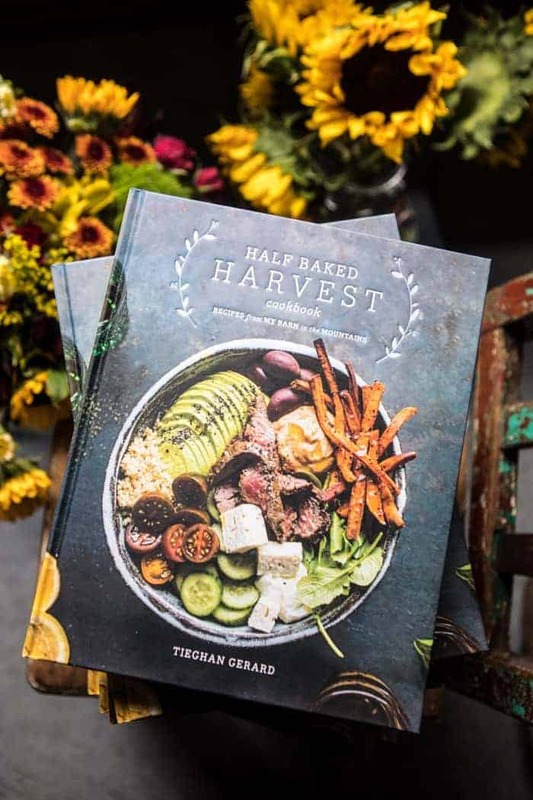 Tieghan, this dish is SO up my alley! And the cranberry salsa with it is brilliant! So many times, Thanksgiving leftovers still kind of taste like Thanksgiving, which is great for some of us, and not so great for those who are over it. This takes those flavors in a whole different direction. Love it! Thanks so much, Ramona! Hope you had the best weekend!! It’s 7:30 in the morning and I’m ready for these already. How about Thirty-One bags for your mom–I like them for everyday and short trips. Since your mom is always on the go maybe these would help. haha! Thank you so much, Nancy! Hope you had a great weekend! PS I have to look those bags up, never heard of them! haha! Thank you so much! Hope you had a great weekend! Looks delicious!! We just finished up your cranberry/ tomatillo enchiladas a few days ago- YUM! A gift I’m thinking of getting my Mom is an engraved rolling pin. There’s a number of people who make them on Etsy and they’re pretty cool. You can make patterns on cookies, pie crust, or even something like clay. I might just need one.. Cough-two for myself ? 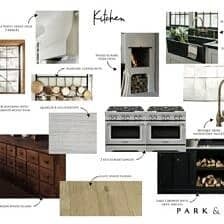 PS love the rolling pin! If my mom used one I would so do that! These enchiladas look fantastic! Perfect for a dinner party! Thanks Brian! Hope you had a great weekend! Yummmmmy!!!! These look so good, and Mexican is my favorite. As for Christmas presents, I hit this wall every.single.year. I usually have some incredible inspiration for a few family member’s presents, but for everyone else I’m completely stumped. Hopefully that won’t happen this year! Oh good luck! Christmas presents can be hard! Ooo! I can’t wait to try this. 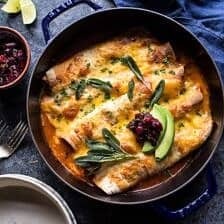 I’ve made a few of your enchilada recipes in the past and they’ve always turned out to be so, so delicious, just like every other recipe I’ve made from your glorious site! 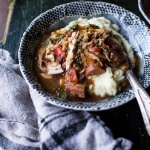 What a unique way to incorporate turkey leftovers! These enchiladas look beyond!! I’ve never been more excited to have leftovers ;). 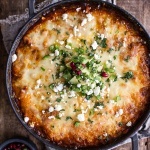 I love everything about these enchiladas- great idea!!! 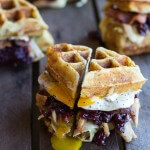 This recipe does look amazing and I can’t wait to try it!! I’m sure I cannot wait for turkey leftovers, my debut will be with chicken! And we’ll just go from there…I found a giant sage bush in the neighborhood last week, so this is perfect!! OH! A sage bush, I am so jealous! Enjoy the enchiladas and thank you! Thanks Lauren! Hope you love the enchiladas! Such a creative mashup of flavors! Love this, Tieghan. Thank-you for the delicious looking recipe! I haven’t made enchiladas in a long time and I think I’m over due plus this looks amazing. We’re actually not having turkey this year (small group) and a really slow oven so this recipe shall be made with chicken :D.
Hope it is a huge hit! THANK YOU! 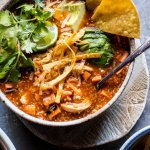 I know this post is sponsored by El Paso but is there any recipes or flavor profiles you recommend if we want to make our own enchilada sauce? Thanks! 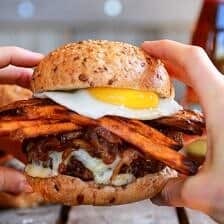 This was just the most awesome recipe! I tried it with some chicken and it was delicious. I am sure it will be even better with turkey. The cranberry sauce was very unique, and I bet that it would also taste yummy on a sandwich! I don’t think I’ve ever commented on a recipe, but this was better than Thanksgiving dinner. 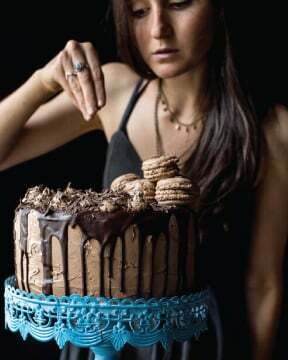 (And recipe I’ve done has been an absolute winner too!) I couldn’t stop eating it! 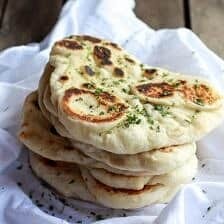 Delicious recipe. I made my own enchilida sauce since i couldn’t find any at the store and used chicken instead of turkey, but followed everything else to the t. The crispy sage actually really adds to the dish!! I’ve made this two years in a row now with Thanksgiving leftovers. Mmm I forgot how good it was! I love that gouda + sage. Perfect recipe. Thank you again for another great meal! I love that creative brain you have, girl! Wow!! SO awesome you have made it two years in a row!! Thanks so so much!! Is this recipe calling for 10 1 ounce cans of green Chile enichilada sauce and 10 1 oz cans of red as well? Thank you.